Many of the sophomore, junior and senior class officers elected Wednesday ran unopposed, and some positions were left unfilled because no candidates appeared on the ballot. Despite an extended deadline for candidate petitions, five class offices will have to be filled by their governing class councils, according to Dean Miller '91, a member of this year's Undergraduate Association election commission. 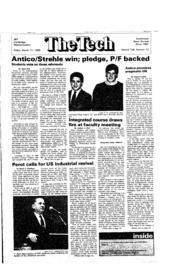 The extension on the petition deadline managed to placed candidates in six previously empty races, but the positions of treasurer and class agent for the Class of 1989, secretary and publicity chair for the Class of 1990, and publicity chair for the Class of 1992 were all left without a candidate. In the senior class, only the presidential race was contested. Incumbent Carissa Climaco retained the office by defeating Darian C. Hendricks. The other offices were filled by the names which appeared on the ballot: R. David Duis for vice president, Henry Houh for secretary, and Laura Braurer and Christine Leviness for members-at-large. Both the positions of president and vice president were contested in the junior class elections. Joe Babiec was elected class president, while Stacy Segal will became vice president. Humphrey Chen successfully ran unopposed for treasurer, as did the team of Will Botti and Priti Paul for social chairs. The most heated battle of the class elections was the sophomore presidential election. Aimee Quijano defeated three other candidates to become the next Class of 1991 president, and Judy Chen defeated Pete O'Neill to become class vice president. All other seats were uncontested. Manish Bapna will be treasurer, Amy Thorsen will be secretary, Rachel Wilks and Dawn Mitzner will be social chairs, and Orlando Martinez will be publicity chair. Incumbent Aileen Lee defeated Rizwan Virk in the freshman presidential contest, while Mitchell Liu beat John Welch in the class vice-presidential race. Pete Wainman defeated Denise Purdie for the treasurer's spot; Celia Liu took 61.9 percent of the vote in her win over Arvind Lakshminarayana to become secretary; and Peggy Hsieh and Rebecca Niles defeated the team of Jenny Rigney and Eva Regnier in the race for social chairs. As usual, the freshman class had the highest voter turnout and the most contested seats.